Shoot and share your pictures to your family and friends effortlessly. With FlashAir™, there's no need to pull out the SD card from your camera and upload the pictures to your PC in order to share them. The FlashAir™ is embedded with a wireless LAN chip which allows you to share your pictures via smartphones or tablets (up to 7 users in one go)! Simply download the Android or iOS app below. 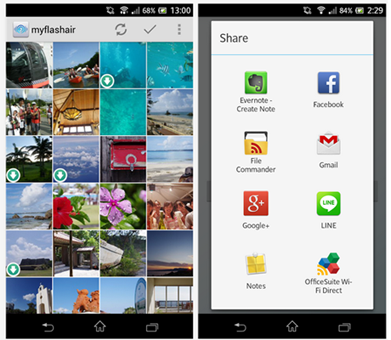 To view the pictures stores on FlashAir™, simply use your standard internet browser, Android or iOS app to download the photos.The new firmware also features an 'internet pass-through' mode that further simplifies photo sharing. 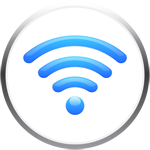 Once a mobile device is connected to the FlashAir card, the internet pass-through functionality enables the device to access the internet via a wireless access point. 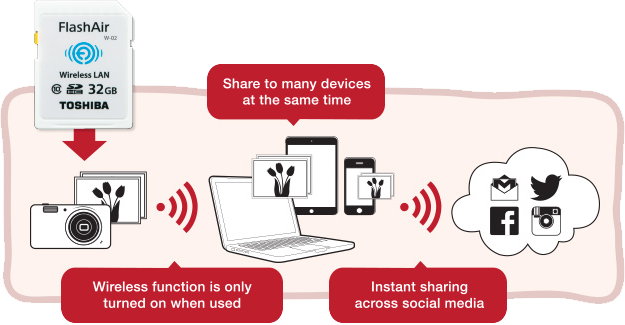 This removes the need for users to swap between a WiFi connection and the FlashAir card when uploading images to social media sites. This new functionality will also be made available for the recently introduced 8GB and 16GB Speed Class 10 FlashAir cards running earlier firmware versions, which can be updated by using the Firmware Update Tool. FlashAir™ maximises your camera's battery longevity. The pictures will only be downloaded to your devices when it's being pulled out from the SD card.